To me, the 7th pick for the Bulls is a conundrum, wrapped in an enigma, surrounded by uncertainty. I'm very glad I am not on the clock. I enjoy the folks who have this figured out, but they must be referring to the top 3 because after that 4-10: yikes. I read your column on Young (no relation) and became intrigued. I was originally thinking no on a guard but the bigs, while seemingly safe, appear uninspiring. Young can either go Jimmer or Steph but probably not in between. Is it worth the risk? Do we need another serviceable big? Yes. Again, glad it is not my call and without the benefit of hindsight I would not be against either direction. An interesting season is followed up by an interesting draft option. I will rely on the certainty of your readers as they figure this out for us. Sam: That summarizes the Bulls quandary well. Get it right because we will be judging you three years from now. It's why these things are really difficult. There are players who will be NBA regulars and rotation players for years in that top 10. But should it be about going for the jackpot when you both need a star, but also to fill out a roster with competence? The Bulls under John Paxson have a history of being somewhat conservative in the draft, but not when they had a top 10 pick, like Tyrus Thomas in 2006 and Joakim Noah in 2007. Neither was the safe pick with Thomas' strong late NCAA tournament showing and Noah in free fall amidst declining playing and drug use rumors. So there's only guessing for us, and with Doug Collins a top adviser now, that adds an element of swashbuckling based on Collins' preferences when he was in Detroit and Washington. So here is where I am now: Like Mel Kiper doing all those mock drafts for two months before the NFL draft. Nothing happens and he changes the top picks every week. So going into the lottery, I was leaning toward Mikal Bridges of Villanova given the Bulls open desire for a small forward/wing shooter and defender. Then in looking at the order of picks as the Bulls got No. 7, I switched to Duke center Wendell Carter. Now I can see Michigan State's Jaren Jackson. There's been a lot of debate about Missouri's Michael Porter, but I believe once his health records look good he'll move into a top four with Ayton, Doncic and Bagley. Then comes Dallas, who with a lot of free agency talk and Mark Cuban's impatience I don't see taking a young big man. Jackson is still 18 and only turning 19 as camp starts. He's a few years away from actually helping a team, it seems. I believe Orlando at No. 6 goes for a point guard, either Young or Sexton since they have no one to dribble. Among the popular three bigs there with Bamba, Carter and Jackson, Jackson is believed to have the best chance to emerge with all round play. I can see the Bulls selecting him if the draft goes that way. I'm fairly sure I'll have several different choices before the draft. No one seems to mind Kiper changing his mind almost daily. You just have to do it with authority and have a big board to point at. 1st pick needs to be Knox or Porter IF he's healthy, then Dontae D from Villanova with the New Orleans pick. Leave the big guys alone! I like Mikal Bridges I just don't think he has as much upside as Knox. We need wings that can score to compete against Boston and Philadelphia. Now if you can trade both picks and get Ayton? I'm all in on that! Sam: Of course everyone can pretty much forget getting No. 1. I heard the Suns GM on the radio talking about having said he'd listen to offers. He basically without naming names mentioned Durant, Harden, Giannis and Davis to get the pick. I can see the Villanova guy in the mix at No. 22, which is basically a list of who falls to you based on your rankings. You don't look for position there, but talent. This draft looks deep enough to get a good rotation player there, though that's adding two more kids to a roster of kids. Better be patient. Few rank Knox that high, which is the flaw in the thinking of so many of these GMs. If you like him and everyone else thinks he's 13, say like Donovan Mitchell last year, take him five and shut off the TV right after your pick. He's also another baby, still 18, and said to be more versatile than explosive. He's another player who doesn't finish at the basket well, and that's a huge issue for these Bulls. But at 18 who the heck knows what he will become. He does fit the profile of a wing player. I think the bulls should be able to get two really good players. The two guys I'm looking at is C-Mo Bamba (7' w/7'11 wingspan) and PG/SG Grayson Allen (6'3" w/6'7" wingspan) sneaky athlete. I think both young players would be able to provide an impact immediately. Also, I think bulls need to explore trading one of their point guards and big man. Sam: I'm listing a lot of these suggestions just to show there will be so many I told you sos after the draft and beyond. Which is why a savvy management smiles at the mentions, but takes none seriously. I'm not a Bamba guy because of that uncertainty about whether you can leave him on the court in the fourth quarter when teams switch to smaller lineups. I know Gobert has had success along with Clint Capella. But they don't often finish games and were not lottery picks. Heck, the Warriors start games without a big man. Don't you need more than a role player with a top 10 pick? Of course, the Bulls are brutal with rim protection and Robin Lopez isn't long term. So, yes, they badly need defensive protection. Thus I also wouldn't be shocked if they went for the wingspan. Again, I like Grayson Allen also as the Bulls need some of that attitude. You figure guys like that just will succeed. Bulls need Doncic to somehow fall to 7. I think he fits their team perfectly. Doncic, Porter JR or Bamba would be nice additions. Well Doncic just lowered his draft stock!! Not sure by how much though. He announced he's not sure if he's coming to the NBA this year. Is he avoiding Sacramento? I hope he lasts until 7 and the Bulls can pick him. Sam: I haven't heard the latest with Doncic, but there's no way he'll be available at No. 7 and I doubt he'll sit out and stay in Europe. Do you know there's an annual Serbian Food and Culture Festival in Sacramento ? He'll love California. Much better weather than Chicago in case you hadn't heard. I liked Porter's interview. He seemed more relaxed and less “on script” than the rest, also supremely confident and eager to show everybody. And he was smart enough to add that he'll be a humble rookie and do whatever his coach asks. If he works out well and is still around at #7 (alas, and unlikely combination) I'd be very tempted. I'll say this; I like Trae better than Wendell Carter. I don't see Carter as another Horford – not as agile and not as smart. I'm also not impressed with how he took a back seat to Bagley at Duke. I guess it's good that he's no prima donna, but at #7, I'd rather have a guy who wanted to be the top dog and tried to be better than Bagley. Coachability & flexibility are good, but I also want a guy with ambition; someone like Trae, who doesn't just want to make the team, but make his mark in the NBA. I could be wrong about Carter too. But if he's the only big left at #7, I'd take a pass if Trae is there and if not I'd pick a Bridges. I'm just glad it's not my call. Sam: Young is the really interesting one, seemingly the biggest risk/reward guy. I wouldn't be afraid to take the chance, but then, again, no one is blaming me if he's Adam Morrison or Jonny Flynn. Young's barely over six foot and slightly built, which scares away some. There's also the potential conflict/message to Kris Dunn. Point guard of future? Well, we drafted another one. Of course, if he didn't take that as a challenge and try to dominate the guy he might not be the guy for the future you want. The Bulls are missing a lot of things as 27 wins suggests. But they really are missing that long distance shooting/ball movement component someone like Young could potentially deliver. I say potentially because maybe at the NBA level he cannot get off his shot, isn't quick enough, his play is more like the second half than the first, that he's not getting 25 shots to get his average up. But you sure would like to have someone with that kind of shooting range without much conscience or hesitation and an affinity for ball movement. Hey, he could be my pick in a few weeks. The Bulls should definitely go for the jackpot and over the nice profit even if doing so comes with the risk of busting out. Of course it's easy for me to say as my job's not at stake. But I'm arguing they should take the player with the high upside because they are in the relatively early stages of a rebuild. They are not going to be a top-five team either way this coming season so take a chance on getting a star. You need stars to win it all. Back in '06 they took Tyrus Thomas when they already had a pretty solid core and were a winning team. That would've been the time to limit risks and take a nice profit (Aldridge). My fear is they go for the low-ceiling sure thing now because the team needs to win. I see your point that they're not at the beginning of the rebuild due to Markkanen, Lavine and Dunn. But they're much closer to the start than the finish. I'm intrigued by Porter Jr. like everyone else, but it's hard to see the Bulls going for building around two big men under the age of 22 who both have back problems already. That seems like too big of a risk for the way the Bulls make decisions and with the trauma of Rose's situation in the rear-view mirror. I'd like to see them get Bamba but am guessing he'll be gone by then. Sam: Yes, it's a good point about the risks with back issues, though Markkanen's hardly was on the level with Porter's. But that's part of that higher risk thing you advocate. I was OK with the Thomas pick because they had not been selecting high level athletes. He was another freshman and you never really know at 18 years old if they care to compete. Tyrus didn't much. Of course, if Porter does get to No. 7, then you might ask if others believe there's something wrong. Or else why would that talent fall that far? As I suggested above, I can see Bamba make it to No. 7, but he is hardly a high risk pick since they don't even list centers on the All-Star ballot anymore. He's got other issues, obviously, but you see Miami invest all that money in Hassan Whiteside and they rarely play him after halftime. If you pick a big man, I believe it has to be one who can switch and cover outside and shoot. Apparently the Clips would like to move up in the draft as well as others. It's difficult for me to support a 12 & 13 pick for the Bulls # 7 but what is your view? Sam: Difficult and impossible. I know, Donovan Mitchell, but with the Bulls having No. 22, enough with teenagers and freshman and kids. They finished last season with 10 players on the roster 24 and under. They're adding two more in the draft. Lopez has a year left. Yes, Boston has done great with young players, but both were top three picks. With Horford and Smart, that's four players picked higher than seventh. The Bulls have one in Dunn. I don't see the ability to trade up in this draft, but no way I'm trading down to add more kids. Are the reports true the Bulls have a promise to a player, Chandler Hutchinson? Probably sparked by a leak from his agent to attract other teams. I thought it seemed odd. Never saw this kind of promise in my life. Sam: Actually, the Bulls promised Ayton if he falls to No. 7 they'll take him, so he can relax. Of course, it's made up by an agent to promote interest in his player. It's a common tactic among a field of people whose credibility ranks lower than members of Congress, lobbyists, lawyers and Academy Award accountants. I assume Hutchinson is one of perhaps a dozen on the Bulls No. 22 list given he's another wing player the Bulls have been talking about and likely won't get at No. 7. But what if Porter came through with back issues? Would it be worth a shot at No. 22? After all, many said Embiid never would play and sat out two years. It has been worth the wait. Of course, the Bulls never would make such a ridiculous promise to a player who is considered only possibly a first round selection. Who exactly would they be keeping him from? There was a story on NBA free agents who need a change of scenery, like Alex Len, Nerlens Noel, Jahlil Okafor, Rodney Hood, Mario Hezonja. Any? Sam: I haven't got the sense the Bulls are dipping into free agency this summer, but it's surely possible. It's the youth of the roster that's an issue. Who fits? They said they do not intend to pursue a lottery season like this one, though from the looks of all that youth the playoffs would seem to be in question this season. But there also are a bunch of troubled and even starting again teams in the East, like New York, Brooklyn, Detroit, Washington, Cleveland (without LeBron), Orlando, Atlanta, Charlotte. So it's hardly inconceivable the Bulls could be in a playoff hunt late next season without trying too hard. Plus, their current Big Three have hardly ever played together. Perhaps they remain healthy next season. For now, I see them getting a big man in the draft, so perhaps a shooter in free agency? Though the plan seemed to be from the start to aim at 2019 free agency. We'll see. I'm interested in your thoughts on next season for the Bulls. I see our biggest need of development and taking the next step for Dunn, LaVine and Markkanen. Whilst I'm interested in the draft and hope we can get a strong wing at 7 and a diamond in the rough Center at 22 it's really all about those 3. In your opinion what's our greatest need? Sam: Well, at 25 wins you're not in that great a position to begin filling positions. But you've heard Paxson most talk about adding a wing, small forward player, the so called 3-D player who can shoot threes to, in theory, open the court and defend an elite scorer. A lot to ask of a rookie after a year or two of college, but it's just one year into the retooling. 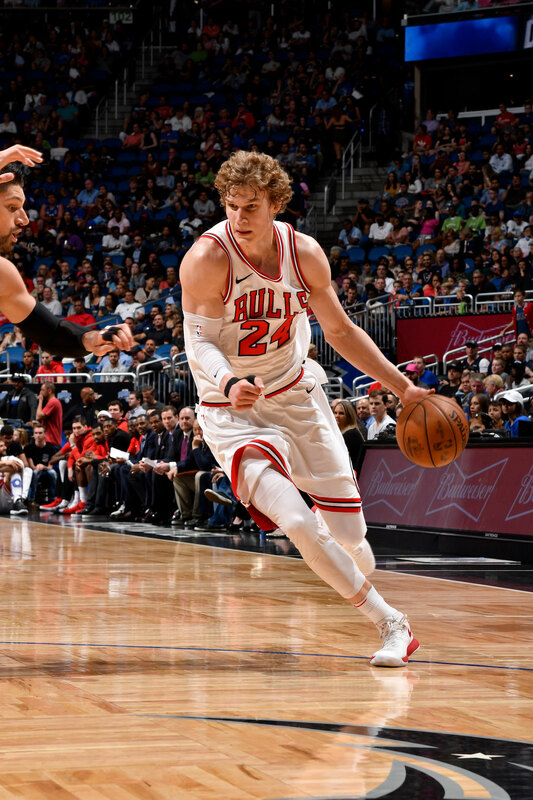 I do think more of next season will be devoted to pushing to see if Markkanen, Dunn and LaVine work together and what they need to work together better. 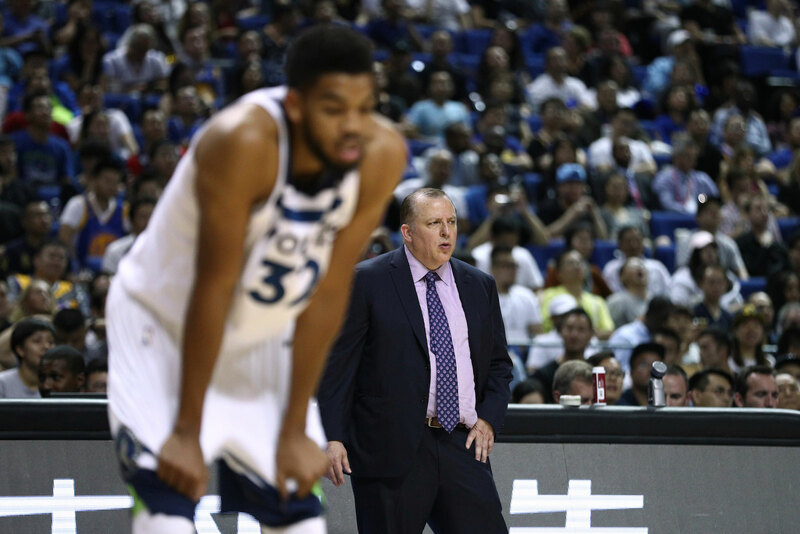 If the situation between Karl-Anthony Towns and Tom Thibodeau reaches a point of no-return, Adrian Wojnarowski said he believes ownership would side with Towns. Sam: I think so did that poll of everyone waiting for the CTA and Metro this week. It does appear Thibs has gotten himself in a mess if it's true that his best player (I know Jimmy made third team all-NBA, but who would you take?) is at odds with him. I haven't read any denials. I also don't believe Towns is going to be traded, though there was speculation about Towns for the No. 1 pick. With Towns coming up for an extension, I doubt Phoenix would be interested in a swap. Like baseball, the NBA likes those years of service exceptions. What a free agent Towns would be. It's always a risk to pass up your extension and few do, but if he played it out two more seasons there would be a LeBron type 2010 bidding. While Thibs remains a top coach, it still is inconceivable that someone gave him a job that requires considered interaction with human beings and not exclusively basketball videos. The playoffs just got exciting! (1st game in the Conf. Finals that wasn't decided early. Fun to watch! Sam: It was a heck of a first round; but, yes, it's been mostly brutal until Tuesday. I heard the NBA people bragging about the improved TV ratings and figure people just fell asleep with their TVs on. I've gotten a lot of my HBO and Netflix movie watching in after halftime of most of the games in the semi and conference finals. I cannot recall so many top teams giving up after falling behind. I wonder how much it's part of the new trend of the public and media always talking about rest and fatigue and players deciding to wait until the next game. It's a worrisome trend. Danny Ainge's trade with Philadelphia giving up Futz and taking Tatum 3rd plus Philadelphia's pick indicates he knew something others, certainly Philadelphia, missed. It appears to me that Ainge, his scouting staff or something in the Boston organization is noticeably better than the rest of the league. Sam: There's no denying how great he's done in analysis and opportunity, the trades of Garnett and Pierce setting him on the right path. I also like the way Ainge has avoided the pack. When he drafted Jaylen Brown a few years ago, he was widely condemned, especially in the instant analysis on TV and the next day online, for picking him “too high,” as if observers have any idea how these kids will fit and that everyone should have the same view of talent. But you do find most teams sharing lists with each other so as not to be embarrassed with media the next day or that night. Perhaps partly because of the way he approached the game with such fervor that defied general acceptance, Ainge is comfortable going his own way. The best executives do that and accept the results. Did you hear comments on ESPN about the Bulls rebuild? They see it lasting 5 or more years. I totally disagree because, the Bulls have a couple of good pieces right now to start with (Markannen – Dunn – Zak ). You have a couple of good pieces Off the Bench (Portis & Valentine). You have the picks next month which should land us another addition. They will have cap space for the Summer of 2019 and a much better picture of who to go after once everyone plays together another season. I don't see a championship contending team in two years but, I do see a playoff team able to advance. Sam: They really are not out of line. If it produces a final four, a conference finals appearance by then, I assume the Bulls will be pleased. I know everyone would like to fit Markkanen, Dunn and LaVine into All-Star weekend soon with some complementary pieces in the next season or two, but what, they played five games together? Check out the Warriors, whom everyone would like to be now. They drafted Curry in 2009 and missed the playoffs the next three years, averaging 28 wins. In the 66-game, 2011-12 season with Curry and Thompson on the roster and David Lee an All-Star, they were 23-43. The next two years they made the playoffs with first and second round ousters, a combined playoff record of 9-10. So it was five years after drafting Curry that they made their breakthrough. And he spent three years in college and was almost 22 in his rookie season. These things require time and good breaks. In the 83-84 season, Reggie Theus' average dropped 9 points a game from last season's average of 24 along with 4 rebounds and 6 assists. His minutes also dropped to 20 minutes...what was the cause of this drop in play and performance ? 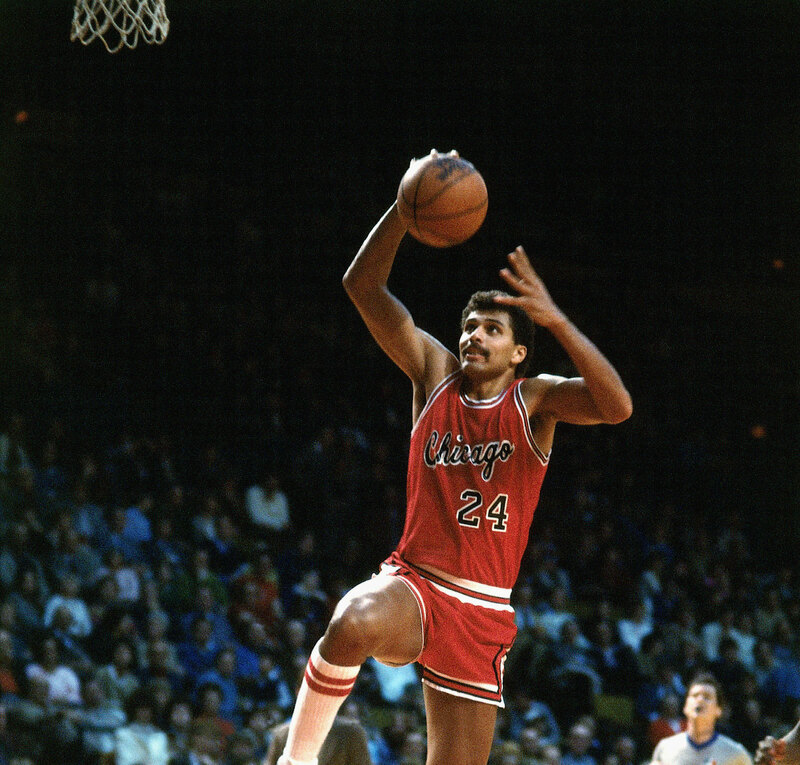 Theus had been a 20/6/4 ball player for many seasons with the Bulls as their starting shooting guard. Had it not been that struggling season that led him to his trade to Sacramento would the Bulls have chosen to stay with Reggie as their starting shooting guard rather than draft Michael Jordan? Sam: It was the original Bulls tank. That 1983-84 season was the first outrage that led to the installation of the lottery. Rookies were not that highly valued before with most teams relying on veterans to succeed; Bird and Magic changed that thinking, and with Hakeem (then Akeem) Olajuwon presumably in the 1984 draft, it was a race to the bottom. Theus was a terrific scorer as a shooting guard, though obviously no MJ. The Bulls were aiming for Olajuwon and not Jordan, as was everyone else. Reggie had held out that fall in a contract dispute, which was common in that era. I recall Karl Malone doing it perhaps a half dozen times. So coach Kevin Loughery got sideways with the popular Theus, an All-Star, and GM Rod Thorn used that as a way to undermine the roster in the hopes of getting far enough down in the standings to draft Olajuwon. There was a coin flip between the East and West teams with the poorest records then for picks 1 and 2. The 76ers had the Clippers pick as trading top picks also was common in that era, eventually limited by the so called Stepien Rule for Cavs owner Ted Stepien who kept trading all the team's draft picks to compete week to week. The league stepped in to save the franchise from its owner. There's been speculation that the Rockets should for would or could have traded Ralph Sampson to Portland, which had the No. 2 pick from a trade with the Indiana Pacers after losing the coin flip. Plus, there was stuff going on allegedly with Portland. They had Clyde Drexler from the 1983 draft, so they were looking center. The consensus then was you needed a great big man and preferably two. No one believed an Olajuwon/Jordan pairing was the formula for success. Portland ended up being fined for supposed contact with college players in perhaps trying to get Patrick Ewing to enter the draft. But threats to deny them the draft pick were dropped. Olajuwon did leave early. When Houston won the coin flip after Portland called tails, Portland went with the next best big man in Sam Bowie. Thus Jordan dropped to third and the Bulls. The Bulls had offers from the Mavericks at four with a package built around high scorer Mark Aguirre from DePaul and the 76ers at five with a package built around then healthy Andrew Toney and Charles Barkley. But the Bulls were not giving up the Jordan pick for anyone but Olajuwon. The Bulls only got Steve Johnson and some second round picks for Theus, a lopsided trade in talent. But with the resulting tanking that led to Jordan it could be considered the best trade in franchise history.